I’m subscribed to Espressif Systems’ notification system so that I received an email each time there’s a documentation update on their website, and this morning they posted ESP32-S0WD Datasheet, the single core version of ESP32 processor, which we reported in our post about ESP32 5×5 packages. While ESP32 datasheet shows a dual core up to 600 MIPS, so maybe the max frequency is also limited. I could not find any ESP32-S0WD module or board just yet, but GridConnect is selling ESP32-S0WD chip for $2.35, ESP32-D0DW(Q6) for $2.75, and ESPD2DW (dual core with 2MB embedded flash) for $3.25. For comparison, the same site sells ESP8266 for $1.75, so it should mean we should soon get even cheaper ESP32 boards with WiFi and Bluetooth 4.2 LE, but just with less processing power. Note that price should be even lower if you buy in quantity from resellers in China. 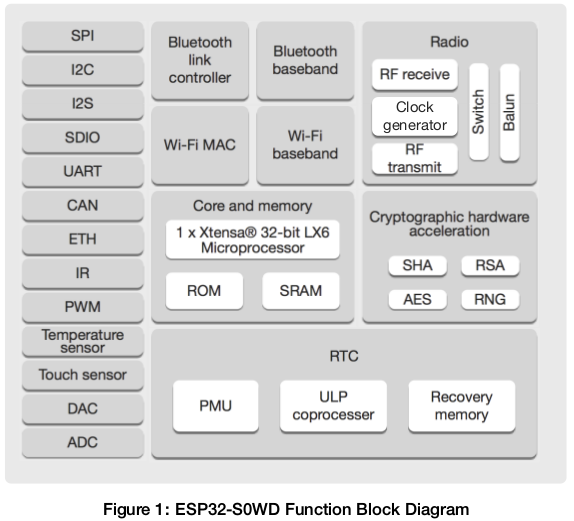 ESP32-S0WD would be especially suited as an upgrade for products that use both ESP8266 and an external Bluetooth chip, as it would offer a smaller and cheaper solution. These chips are getting sexier by the day ! Excellent news!! Looking forward to see some boards now. Interesting. Are there any similarly sized chips that have embedded hardware acceleration of video encode/decode for currently popular codecs and resulotuion? No need for display output so hopefully not a full GPU. The linked to article talks about possible support for 802.11ac. Do these chips also support 1 GbE? So with the vanilla dualcore ESP32, can it be setup where one core is running with no interrupts?